“David Hockney really has been one of the most influential British artists of his generation,” says Richard Benefield, deputy director of the Fine Arts Museums of San Francisco (the umbrella organization for the de Young Museum and Legion of Honor). “In fact, he is arguably one of the most influential artists of his generation, period, because, even though he’s continued to work in a figurative style, he’s been open to exploring every possible technology that’s come his way.” Hockney is also, like the artist he most cherishes, Picasso, incredibly prolific. For these reasons, the de Young’s “David Hockney: A Bigger Exhibition” (October 26, 2013 – January 20, 2014), which covers Hockney’s career over the past decade (2002 to the present), will be the museum’s largest show ever. It features over 300 works (some of which were drying even as the final show list was being created), sprawling out over 18,000 square feet, 12,000 of that being the museum’s regular temporary exhibition space and the final 4,000 in four upstairs galleries. Born in Bradford, United Kingdom, in 1937, Hockney, who splits his time between the countryside of his native England and Los Angeles, began garnering an increasing attention for his work in the late 1950s. At that time, as Benefield–who is also co-curator of the exhibition, with Gregory Evans–notes, the work was rather intellectual and verged on abstract. 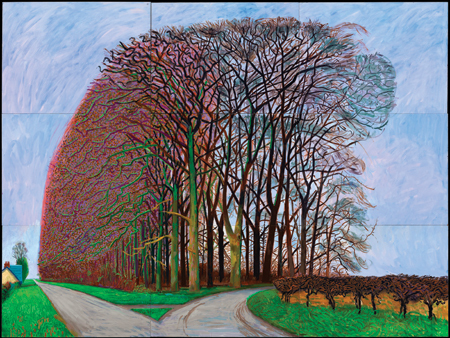 However, Hockney’s art has always maintained a connection to the figurative and has always exhibited the artist’s talent for drawing, an activity he’s pursued since childhood. Indeed, at the foundation of all his work, even the artist himself claims, is drawing and line. To these ends, Hockney created lithographs in the 1960s and 1970s. “He loved making prints,” notes Benefield, “because that was a way to disseminate his pictures to a larger audience.” From there he moved on to faxing drawings, then to creating high-quality printouts on a color photocopier, employing each technology when it was new. He’s also worked with photography and in Photoshop and now continually works with iPhones, iPads, and digital cameras–the latter three featuring prominently in this show (and he regularly sends his digital sketches to friends immediately upon completion); in fact, he’s replaced his ever-present sketchbook with an iPhone. But then, Benefield points out, he always returns to drawing and painting. Hockney also sticks with tradition when it comes to the genres he focuses on; he only partakes of the three most historical art genre: still life, landscape, and portraiture. The latter two being what this current exhibition features, with equal weight given to both. 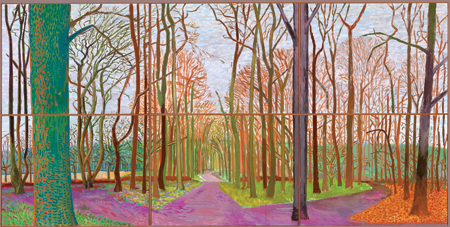 However, to Hockney, all of his work has a figurative quality, even when figures are absent. In addition to the exhibition featuring numerous mediums and a huge amount of work, another standout feature is that several of the works presented are the largest Hockney has ever made: in several instances, a single piece takes up an entire gallery. For example, The Arrival of Spring in Woldgate, East Yorkshire in 2011 (Twenty Eleven), Version 3, 2011Ð2013, which comprises 32 oil on canvas paintings and 12 iPad drawings each printed on 4 sheets of paper; Brugnara notes that the viewer “will be surrounded by what that [the arrival of spring] means.” In another gallery there will be playing four 18-camera films–what Hockney calls his cubist films–one on each wall, of the same location in Hockney’s home area of Woldgate Woods. Each wall features a different season, with each of the 18 cameras providing a slightly different perspective of the landscape: the viewer is thus engulfed in the full spectrum of a year. Notably, the viewer being immersed is part of the piece, thus making these large works implicitly figurative. In the upstairs galleries, viewers will experience some of Hockney’s most recent works as well as a few older pieces, which provide context for the rest of the exhibition. Being shown for the first time is The Great Wall, a huge (72 feet long and eight feet high) presentation of chronologically and geographically ordered images presenting the history of European portraiture from 1200 to 1900. The work is the result of exhaustive research into the subject, leading up to Hockney’s somewhat controversial book “Secret Knowledge,” which concludes that the Old Masters used optical devices to map their works. Some of Hockney’s photo collages will also be on view, these relating to the cubist films and the multi-canvas landscapes, all being studies in perspective. So, with an exhibition so enormous, what’s the best approach for the viewer? “I think that people have to come to the exhibition with an open mind and clear their heads of what they remember of Hockney as swimming pool paintingsÉ and let themselves be surprised.” Benefield says. But, he adds, “Prepare to be a little overwhelmed.” He continues, “There’s so much to see in all of this work, the generosity of the artist himself just putting it all out there for you to take it in.” Perhaps the greatest gift Hockney is presenting, again and again, is providing us with a new way of seeing: from different angles, at different times, in different forms. As amply evidenced in this vast exhibition, he’s abundantly offering the opportunity to look at the world with fresh eyes.